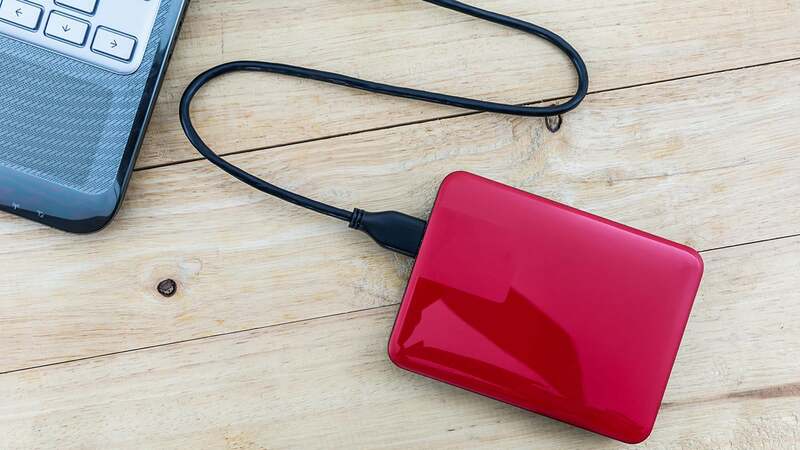 This is the power user's backup program, but it might be a bit much for average consumers. Acronis True Image 2019 is quite arguably the fastest, most powerful backup solution available to consumers. It’s also, slowly but surely, working its way toward being truly user-friendly. It still has a ways to go in that regard, but the the company is certainly trying. The real issue is whether you need all of True Image’s multifold capabilities. This review is part of our ongoing roundup of the best Windows backup software. Go there for information on competing products and how we rated them. True Image has long since morphed from a plain “imaging” program into a backup suite. While it still creates sector-accurate images of your drives or partitions, it also features an online storage component in Acronis Cloud; offers archival and sync functionality; has a hidden restore-from partition (such as those often found with laptops) called Secure Zone; can clone disks; and offers ransomware protection. True Image 2019 also offers just about every conceivable backup option: incremental, differential, super-flexible scheduling, pre/post operation commands, email notifications, just to name a few. There’s also a one-way (mirroring) function for syncing a folder to a destination, as well as client apps for your mobile devices to keep those backed up. Whew! If you really want the maximum backup protection for your system, there’s really nothing else that comes close to True Image in the consumer arena. On the other hand, all that functionality requires a fair number of background processes and a heavy footprint on your system. See below. True Image 2019 keeps seven background processes running. The company wants to control every aspect of every backup chore. We have to admit, they are very good at it. If you’re a software minimalist, there are simpler solutions such as Window’s own File History, a sort of poor man’s Time Machine. True Image 2019’s interface is attractive, in a modern, 2D kind of way. It’s much cleaner than it used to be, but it’s still not particularly intuitive or easy. Tiny scroll bars require finer mousework than is necessary, and there’s a complete lack of tool tips (tiny windows with explanations in them). If you know about backup, it’s easier to get up to speed. If not, study the online tutorials. We’re not kidding. The Personal version of the program is available in three flavors: the perpetual license Standard version (available on Amazon), which costs $50. The subscription versionsRemove non-product link available via the Acronis website include the $50-yearly Advanced version, offering 250GB of online storage as well as end-to-end encryption and social media backup. 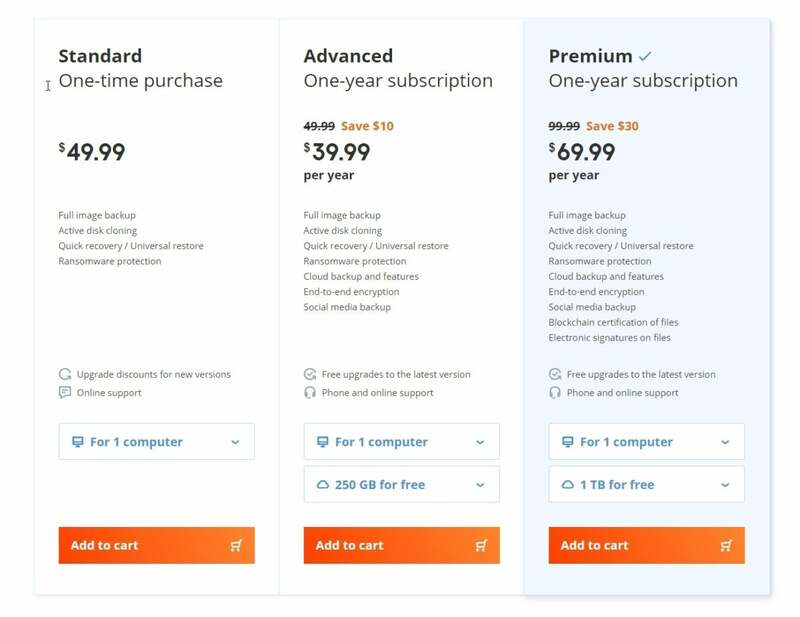 The $100-yearly Premium version ups that to 1TB of online storage and adds blockchain certification and electronic signing of files. With the current discount, you can have your backup and cloud storage for a mere $40. The prices I quoted are full-boat, but at the time of this writing Acronis was running a special: $40 a year for the Advanced, and $70 a year for the premium. Note that Advanced and Premium packages are true subscription software—only the restore functions are available if you don’t re-up. However, you can always downgrade to the perpetual license for $30 to regain access to your local backups. All three versions let you create bootable recovery media with the ability to restore to dissimilar hardware, i.e., not the same type of hardware that the backup was created on. If you’ve ever tried to restore a Windows System Backup, only to discover it doesn’t like your new drive, you’ll appreciate that. True Image is just about the fastest backup program on the planet. It made short work of our test backups, and though there are a lot of background processes, those didn’t seem to impact the daily computing experience negatively. True Image 2019 took about 20 seconds to boot every time we ran the program. This was on a fast PC with an SSD. We’re not sure what it’s doing, but best guess is that it’s security related. Syncing was also quite fast, as were the small test restores I tried using the boot media. If fast performance during the actual backups it paramount, then Acronis is as good as it gets. Acronis True Image 2019 is the real deal if you want maximum protection for your computer and data. But the heavy footprint is likely overkill for the majority of users. I’m still lobbying the company to offer a simpler, Time Machine-like solution that minimizes its impact in system resources. Acronis certainly has the expertise, so hopefully one of these days. 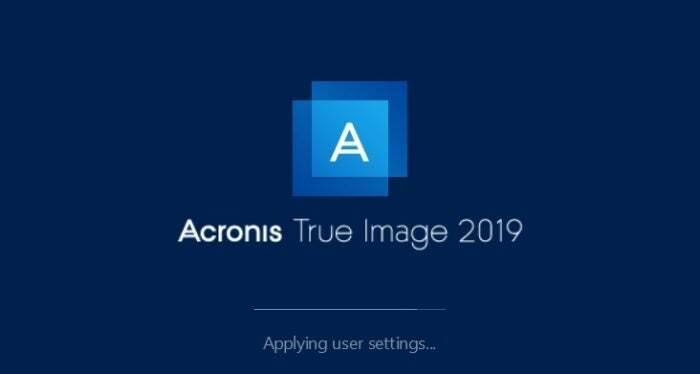 If you want the most comprehensive and fastest backup solution on the market, Acronis True Image 2019 is it. There's nothing backup-related it won't do, and no option it doesn't provide. It even provides ransomware protection. Our only caveat is that it might be overkill for the average user who just wants to back up their data.